Buy the uncut version here! A total of 224,28 seconds are missing in 19 scenes. Running time of the cut version w/o ending credits: 1:24:22 (PAL). Running time of the uncut version w/o ending credits: 1:28:04 (PAL). The running time designations are arranged in the order Cut / Uncut. Umberto Lenzi's Mondo Cannibale (1972) was the movie that laid the foundation for the infamous cannibal genre which reached its climax in the late 1970s and early 1980s and is still controversial among movie fans. 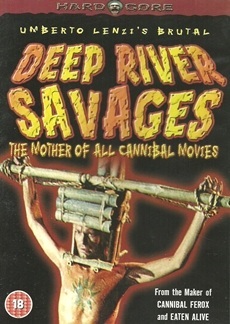 The film was released uncut in the UK on VHS by Derann, but was put on the Video Nasties list and remained there until 1985. The movie had to be cut by 3,75 minutes for the DVD release in 2003 because of the animal snuff scenes. It is unclear why one of these scenes (a goat's throat is cut with a log of blood to be seen) was not affected by this. The 2007 reissue is cut identically. Comparison between the cut DVD by Screen Entertainment (BBFC 18) and the uncut DVD by Shriek Show (Not Rated). The opening credits and the title screen are different. The uncut version features two text overlays. The first part of the fight between a mongoose and a snake was removed completely. The next shot was removed as well. The snake is being bit in several further shots and eventually is killed by the mongoose. The door opens and a native appears with a monkey. A second one helps him to fixate the animal in a wooden apparatus. The next shot with the monkey was removed as well. The cut version shows a shot of John again, the uncut version shows the monkey instead. +1,2 sec. / 0,96 sec. The monkey's brainpan is cut off. The dead monkey can be seen in a close-up, then the chief of the tribe eats some of its brain. After another native has eaten some of it, the chief signals John to try some of the brain as well. John slowly approaches the monkey and takes a part of the brain. The cut version starts again when the monkey cannot be seen anymore. The audience can only guess what is happening in the cut version. The camera zooms out and a cockfight can be seen. The two roosters can be seen again. A cut to a native in the middle was removed as well. The snake is cut open while alive. Then the blood drops on the doll symbolising the unborn child. Maraya is looking worriedly towards the camera. More blood drops on the doll. The complete scene in which a native is killing a crocodile with a knife and then cuts its belly open is missing. The cut version shows the overlay "Fine" at the end.. The ending credits are different as well.